Inspired by the homonymous (and unfinished) novel by Charles Dickens, Fighting Chance Productions brings to Vancouver this masterful and quite unique rendition by playwright Rupert Holmes. This multi-awarded musical has been brought in the past to some of the most important stages in the world, including Broadway and London, earning it several Tony awards and Drama Desk Awards for its originality and perfect execution. As the title suggests, the story evolves around the mysterious disappearance of Edwin Drood (Sarah Wolfman-Robichaud), a young English man of the 19th Century engaged to the beautiful Rosa Bud (Jennifer Doan). Drood’s relationship with Rosa Bud awakens the jealousy of other men, such Drood’s uncle -and Rosa’s singing teacher-, choirmaster John Jasper (Alex McMorran), as well as Neville Landless (Alfonso Banzon), a new immigrant from Ceylon and protegé of the highly-respected local priest, Reverend Crisparkle (Mike Wild). The subtle struggle for the love of Rosa Bud between Jasper, Landless and Drood becomes more and more tense as the story develops. Also, additional clues and variables that can help solve the mystery are revealed by the main narrator of the story, the “Chairman” (Jack Rigg), throughout the play. For example, the storyline tells about Jasper’s double-personality traits and his opium-smoking habits, as well as the growing clash of personalities between Landless and Drood. As the pressure mounts, the engagement between Rosa Bud and Drood is broken around Christmas time. Jasper then organizes a “reconciliation” Christmas dinner to be attended by Drood, Rosa Bud, Neville Landless, Reverend Crisparkle, and himself. Drood mysteriously disappears after the dinner, and is not seen ever again. This play is based on an unfinished novel. Therefore, the original author (Charles Dickens) never wrote an “official” end to this story, nor it is known by anybody, even by word of mouth. 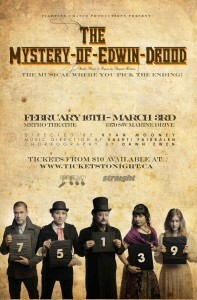 This gives this adaptation a very peculiar advantage, as it provides room for interaction with the audience to they can choose their suspects, give clues, and help solve who is guilty of the disappearance and ultimate fate of Edwin Drood. All these features give the Mystery of Edwin Drood a particular plus, as the ending is always a variable and as such, every performance will potentially have a different ending. This production is a must-see that goes the extra mile to enhance interaction with the audience, which is facilitated by different activities such as enabling the spectators to vote, engaging them in songs, and having parts of the play developing from the hallways of the theatre. Also noteworthy is the complexity of the music performed live by the orchestra directed by Vashti Fairbarn, as well as the complex use of lights, props, costumes and sound effects, which are blended seamlessly in an exemplary display by the production team led by director Ryan Mooney and stage manager Aliya Rozenberg. The lead cast is completed by Emma Rendell, Linda Sum, Chris Lam, James Walker, and Jesse Setka, along with a talented ensemble of singers, dancers and musicians. 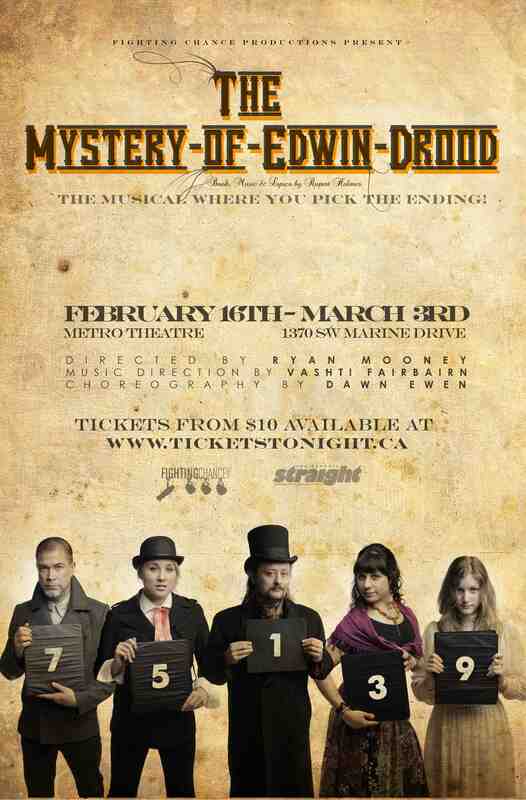 The Mystery of Edwin Drood is playing at the Metro Theatre (1370 SW Marine Drive) from February 15 until March 3, 2012.